You work hard for your money, right? Shouldn’t your money be working just as hard for you? The number one lesson that investing greats like Warren Buffett have known from early on (birth?) is that time is incredibly valuable when it comes to money. The concept is known as the “money value of time,” but this makes it sound unnecessarily complex. In short, it really just means the earlier you start investing, the more money you’ll have later on. So what does that look like when you’re planning for your future? Here’s a tale of two investors: Michael (42) and Rebecca (25). 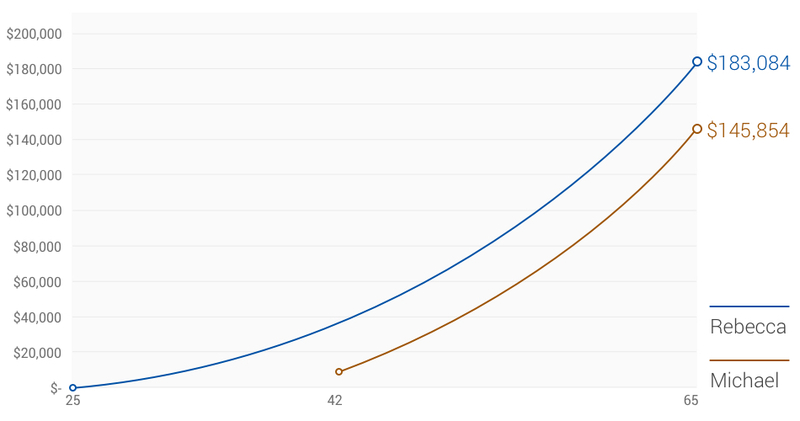 As you read about their choices, try to guess who will have more money when they retire at the age of 65. We’ll start with Michael. Like many of us do, Michael has procrastinated saving for his retirement and is just now getting started. No surprise to us, he’s chosen to invest with RBC InvestEase. Michael splurges with a $10,000 initial investment and plans to contribute $200 monthly through a pre-authorized contribution (PAC) plan. That means it’s transferred automatically from his bank account each month. At the same time, Rebecca starts out with an initial investment of $1,000 (which happens to be the minimum amount to get started with RBC InvestEase) and sets up a monthly PAC of $100. She’s starting earlier, but resources are a little more constrained for her. So, just to recap, Rebecca’s initial investment and her regular contributions are considerably lower than Michael’s. But, she’s got longer until she retires. So, all else being equal and assuming their portfolios generate a return of 5.5% each year, who will have more at retirement? And how much more will they have? It’s understandable to think Michael’s sizable initial investment and higher monthly contributions would put him ahead, but that would be discounting the power of time – and the effects of compound interest. Time is definitely on Rebecca’s side. 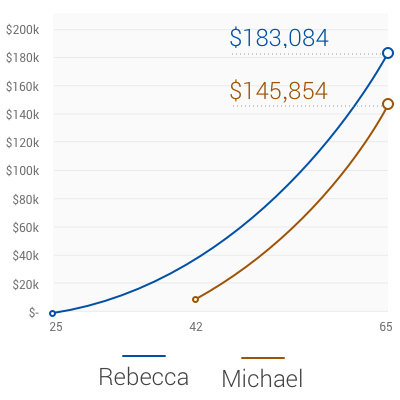 And thanks to that, Rebecca’s portfolio would end up more than 25% ahead of Michael’s by the time they each turn 65 – which means nearly $40,000 more for Rebecca1. Not bad for starting with $1,000 and foregoing a few lattes and a couple of dinners out each month to get going! Here’s where you don’t need to guess. Thanks to the value of time, the earlier you start, the better. But let’s be real, both Michael and Rebecca have done a stellar job in planning for retirement. Why? Because they started somewhere. Find out how RBC InvestEase can help you reach your goals. Cannonball or Toe-Dip: What’s Your Investing Approach?